Have you been waiting for a camcorder with all the right pro features and an easy to use, compact design? Wait no more. The Canon Xa15 is the one you want to be checking out. This little gem was made especially for “running-n-gunning” with the professionals, yet it is simple enough for an amateur to operate. A large number of advanced features and manual controls make the Canon Xa25 an excellent choice for filming news, documentaries, home videos, action films and more. Offering top-notch optics, multiple formats for recording, versatile connectivity options, and an innovative interface that even beginners can quickly master, camcorders don’t get much better than this. 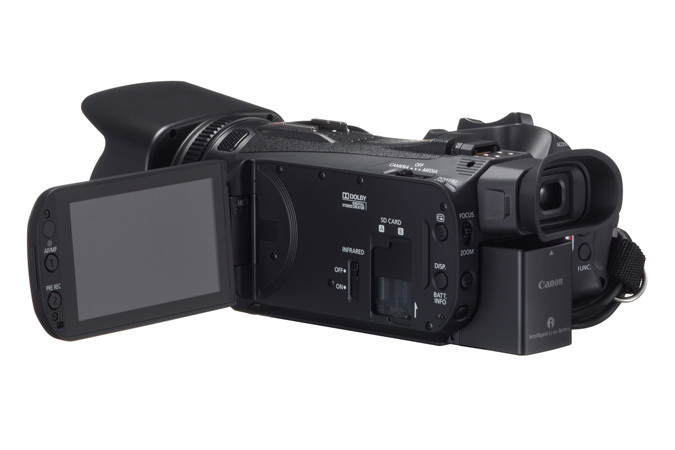 There is zero compromised functionality in the Canon Xa25’s design. High-quality performance is guaranteed. 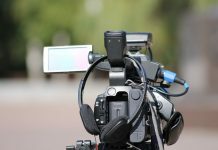 In fact, this camcorder is perfect for everyone from law enforcement agents to educational instructors, both amateur, and professional filmmakers, film students, and hobbyists. Sound promising? Wait till you get a detailed look at the specifications on this thing! The Canon Xa25 has so many high-end options it’s hard to know where to start. This 1.7-pound package is a real powerhouse. 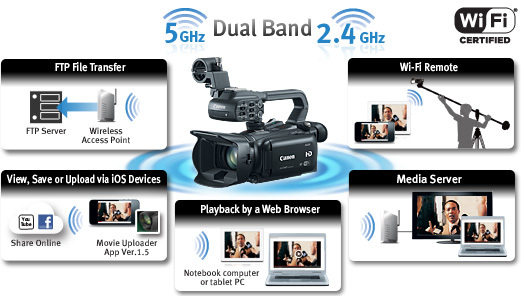 The main features included a Genuine Canon 20x HD video lens with 16 speeds and equipped with SuperRange Optical Image Stabilization as well as both MP4 (35 Mbps) and AVCHD (28 Mbps) video modes. 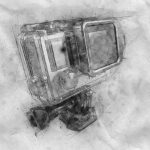 The video resolution is 1080x60p which allows for capturing crystal clear recordings of both fast-moving and slow-motion objects. 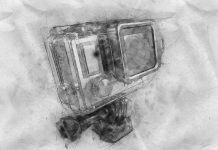 Other significant features include a 2.91 MP Full HD CMOS sensor, a DIGIC DV4 image processor, and dual-band Wi-Fi which enables simple file transfers and uploads. Also, a 3.5-inch OLED touch panel display with high-end contrast, HD/SD-SDI ports, and SDHC/SDXC-compatible card slots for dual recording and relay recording. 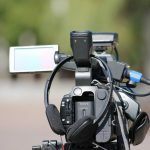 That means you can have master footage ready for professional editing, as well as web-ready videos available to be upload directly to the internet at the same time. 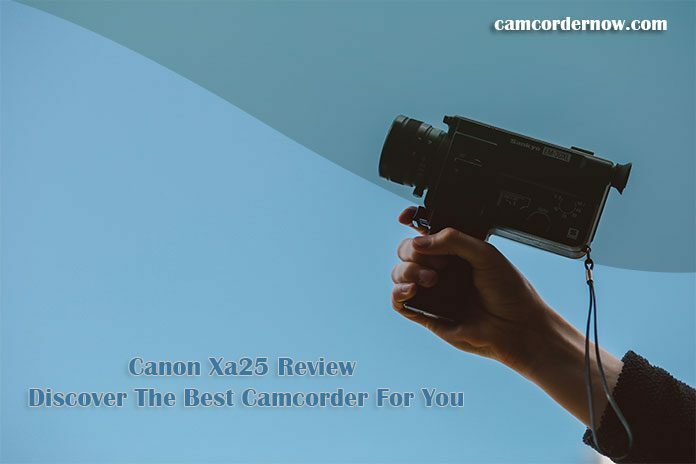 In addition to all the features above, the Canon Xa25 also has a detachable handle with two audio input jacks, a diffuser light, an external microphone holder, a manual gain control, an infrared emitter, a phantom power button, two easy to access zoom buttons and so much more. This spectacular camcorder by Canon can be bought brand new from the manufacturer. However, a used Canon Xa25 can be purchased via Amazon as well as on eBay. To gain a better understanding of the actual depth of diversity contained in the Canon Xa25, let’s take a look at three comparable products. The D750 from Nikon, the FDR-AX100/B from Sony, and the AG-AC90 from Panasonic. We’ll compare their main features, assembly times, ease of use, the quality of their builds, warranty options and of course their prices. 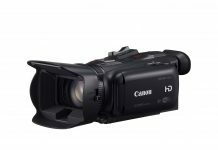 So, how does the Canon Xa25 hold up in comparison to camcorders from other major brands in the same general price range? The D750 by Nikon is a respectable semi-professional camcorder. Like the Canon Xa25, it comes with a CMOS sensor which enables it to have 1080 HD resolution up to 60fps. In other words, it produces just as high-quality footage as the Xa25. However, there are bugs in the audio levels captured during high ISO. Also, it has a lower than average battery life for a camcorder in this category. Significant cons with the Nikon D750 include bugs in the audio levels captured during high ISO. Also, it has a lower than average battery life for a camcorder in this category. The FDR-AX100/B by Sony comes with 4K HD resolution, 12x optical zoom and 24x clear zoom and a BIONZ X image processor which supports MP4, AVCHD, and XAVC-S codecs. All of which are highly comparable with features of the Canon Xa25. It also has image stabilization and is Wi-Fi capable as well. On the flip side, major cons with the Sony FDR-AX100/B are that it is missing the vast range of manual controls of the Xa25 and features such as extra audio inputs and an external microphone holder. The AG-AC90 camcorder by Panasonic comes with 1920x1080 Full HD image sensors, 12x optical zoom, intelligent 25x digital zoom, and dual SD memory card slots. It is compatible with SDXC, SDHC, and UHS-1 Memory Cards. Also, the manual controls are comparable to that of the Canon Xa25, and it also has two extra audio jacks and an external microphone holder. The most notable con we found with the Panasonic AG-AC90 is that it has no focus assist function for zooming. In other words, once you zoom in on something, there is no way to magnify it again, unlike with the Canon Xa25 and Sony FDR-AX100/B. We really can’t say enough good things about this camcorder. Significant advantages of the Canon Xa25 include incredibly high-quality video and image stabilization. XLR professional microphone support, options for focus-assist, and the incredibly useful dual recording formats. Canon did an excellent job in creating the Canon Xa25. Hence, we weren't able to find many cons. The two that we did see, however, was the high price, and a bug in the physical design which blocks the battery release by the tripod mount. The compact Canon Xa25 camcorder is a fantastic piece of recording equipment. A real “run-n-gun” type camera if ever there was one. The Xa25 is for capturing professional quality uncompressed video footage. It is perfect for a studio setting or filming on the go. This lightweight camera is the equivalent to cameras that cost thousands of dollars more. Whether filming a documentary, an action-packed feature film or merely shooting family videos with the highest quality possible, the Canon Xa25 will get the job done and then some. This is why we’ve given it a rating of 5 out of 5 stars. When it comes to camcorders, it doesn’t get any better than this. Do you own a Canon Xa25? We’d love to hear all about it. Are there additional benefits, or drawbacks, that we didn’t mention here on our article? Or perhaps you own a different model camcorder you think is better. Let us know in the comments below! The Canon Xa25 is a combination of a good design and easy usability which makes it good for both amateurs and professionals. It's lightweight and good for filming on the go, and also produces high quality videos which is a choice for studio filming. The only downside would be the video footage that comes out uncompressed, which could be quite heavy on the memory.